- I'm honoured to receive this award, especially from an organization that was created by community. There will be performances, words of wisdom, retrospective art displays, and the unveiling of "Sue Smith's Little Book of Musical Inspiration, In the Words of My Students", a curated collection of quotes by my students during lessons. 2018 Wall of Fame Recipient ...moi. Like A Bird from Sue Smith on Vimeo. In July, I discovered the Peter Bogdanovich documentary on Tom Petty and the Heartbreakers. Watched it all in one go. Very soon after was compelled to write this song. Like A Bird. With the passing of Tom Petty in September it has become an unintended elegy. Tom Petty knew how to fly all along. Love and gratitude to Tom Petty, his family, the Heartbreakers and all who were moved by his music. April 2016: Spring Awakes! is coming. 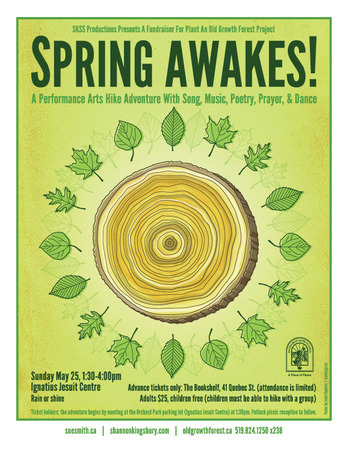 This will be the 5th Annual event, produced by SKSS productions to support the Old Growth Forest at Ignatius Jesuit Centre. Song, dance, poetry and surprise will intermingle with the flushing trees, the rushing river, the blooming wood flowers. February 2016: SEASON SINGERS Session XXVIII is now underway! The all new "Quest For the Rainbow" will premiere on Sunday February 28th at the Guelph LIttle Theatre - 176 Morris St., Guelph. Tickets are on sale now at Janus Books (10 Paisley St., in the MarketFresh Mall) $12 per Adult (CASH ONLY plus handling), Children 12 and under are FREE. All seats require a ticket. Ondine Chorus is gearing up for Solstice Concerts - Dec. 13 at Wellington County Museum (2 pm) amidst a beautiful display of log cabin quilts, Thursday Dec. 17 at the recently re-opened Art Gallery of Guelph, and Friday Dec. 18 at the beautiful Paul Morin Gallery in the Alton Mill Art Centre, Alton ON. Ticket info is on the Calendar page. 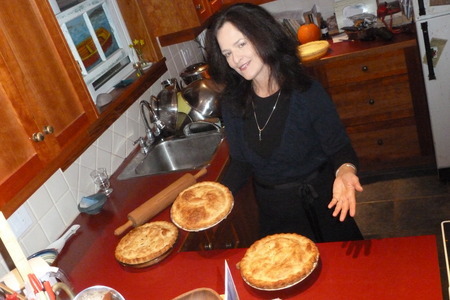 During my recent visit to the MICS team in Gaspe, I made pies! 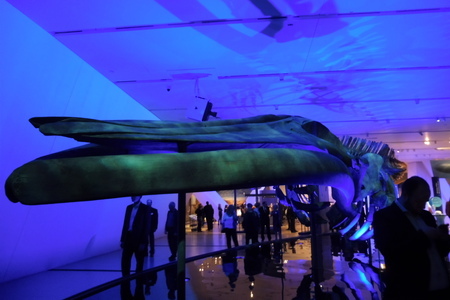 We decorated it as you see because....B105 is a Blue Whale which in years past has been sighted in the Azores, and this year was sighted in the Estuary of the St. Lawrence. This is the first ever physical evidence that an individual has crossed the Atlantic. A great reason to celebrate with Pie. On the computer screen is the photo match of B105. 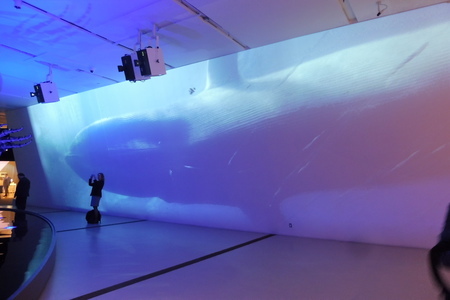 La Grande Bleue - a resounding success at the Biodome and the opportunity to play with Guy St. Onge, Patricia Deslauriers, Paul Reddick, Yves Poirier, and Patrice Dufour and the opportunity to meet Mylene Paquette, who rowed solo across the Atlantic, Halifax to Lorient, France. 17 pies and counting....my annual fall Pie for Whales project to support Mingan Island Cetacean Study and many happy pie-eaters. I saw your show a couple of weeks ago and I was really moved by it - most especially by your song "Beloved Scorned" (I think that was the title). Lots of cool shows coming up this Spring! 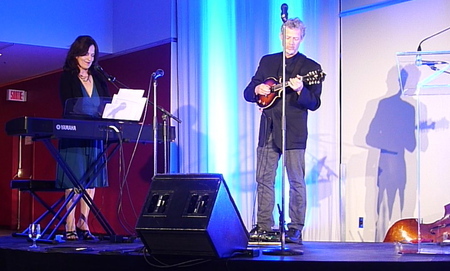 Sue will be performing along with Jeff Bird, Murray Ritchie, the Great Wooden Trio and Comedian Evan Carter to support Bracelet Of Hope on Friday May 9 at the Guelph Youth Music Centre. Shannon and Sue are organizing the 3rd Annual Spring Awakes! event in support of the Plant and Old Growth Forest Project at Ignatius Jesuit Centre. Plan to walk with us - Sunday May 25th, and be enchanted by the spring woods, full of music, dance, poetry and surprise!. Ondine Chorus will be performing two Summer Solstice Concerts - one in the Paul Morin Gallery at the Alton Mill Art Centre - a beautiful, artful, gorgeously resonant space - Saturday June 21 at 8 pm, and on Sunday June 22 Ondine Chorus will be singing a Procession Concert throughout the beautiful sculpture gardens of the Gallery Stratford 2 pm start time. We hope you will join us. Tickets on sale now at the Bookshelf in Guelph. 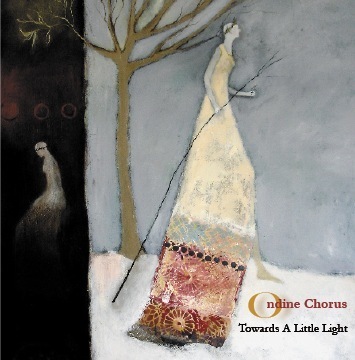 Craig Norris and The Morning Edition premiered of "Into the Dark" from Ondine Chorus' upcoming EP on January 22/14. Sue wrote this song specifically for the Solstice Concert at Gallery Stratford, inspired by the David Rokeby Exhibition. 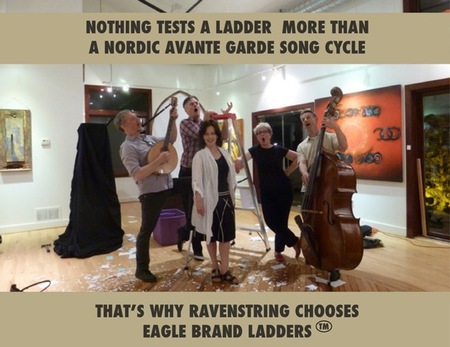 Recorded by Ondine Chorus during the ice storm of December. 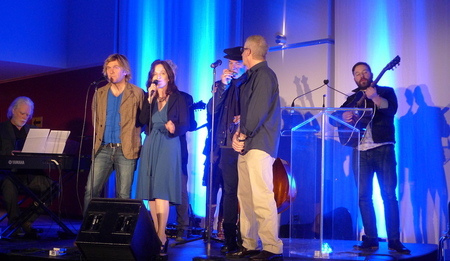 Check out Maresa Bell's video of Season Singers "Sweet Nectar, I Tell Ya" song. New Gallery is up for Spring Awakes! Internal link to: Spring Awakes! Woman of Distinction - Arts and Culture! 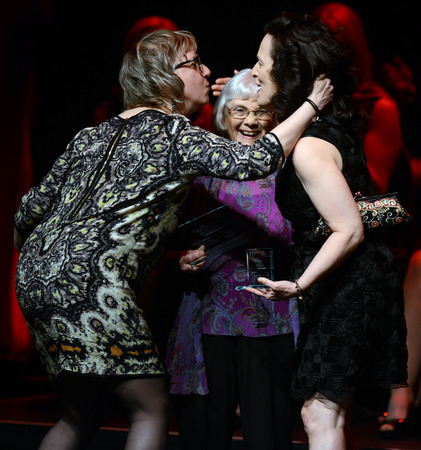 Sue is the Recipient of the 2013 Women of Distinction Award, Arts and Culture! 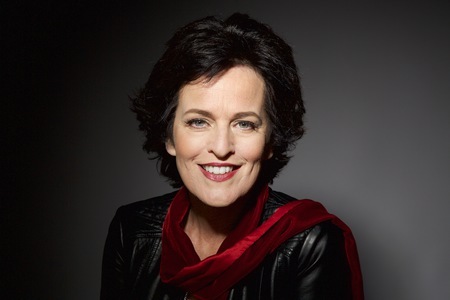 Sue will be the featured artist at the Elora Acoustic Cafe, April 12. Elora Centre For the Arts. 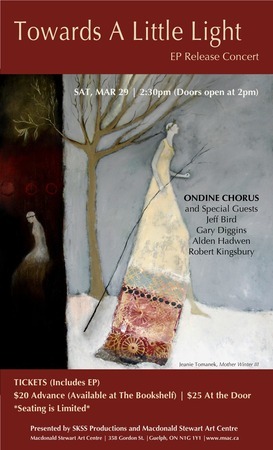 New Gallery has been created for Ondine Chorus. Ondine Chorus will be in concert at the Brubacher's in Elmira, June 23. Stay tuned for more details. 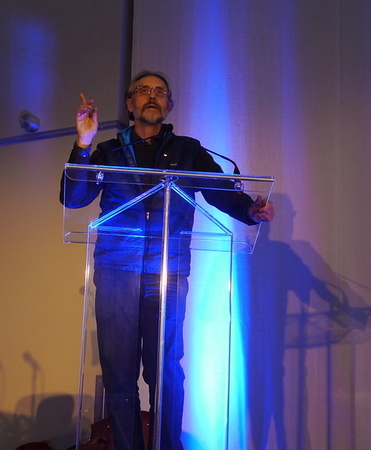 Randy Sutherland's photos of When Mermaids Sing are up! Check them out on the Galleries/Season Singers page. 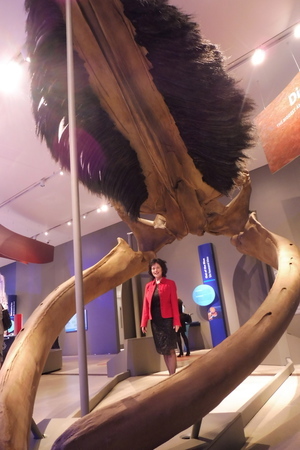 Check out Richard Sear's article on Sue, aka Mme. 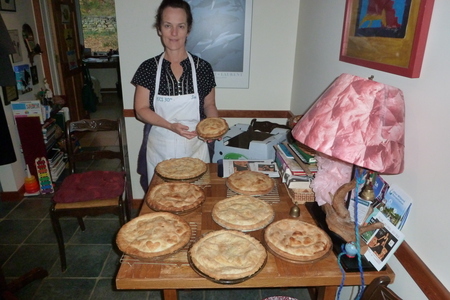 Pomme Tarte, and her ongoing mission to bake pies to raise funds for MICS (MIngan Island Cetacean Study). Check out Sue's blog post on Collaborating with Karen Kaeja and Shannon Kingsbury to create the score for "Crave To Tell"
"Oh Little Planet", a new musical for children, the XXIVth Session of Season Singers, is set to run Sunday February 26 at the Guelph LIttle Theatre. Shows are at 3:30 and 7:00 pm. 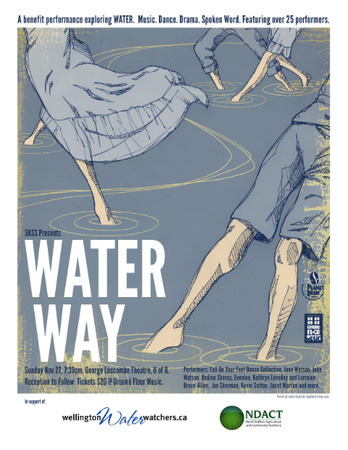 Bringing together professional singers, actors, musicians, designers, visual artists, dancers, storytellers and spoke word artists, Water Way will feature original and time-honoured explorations of our human connection to water. Check out the new photo gallery for "Who Put Out the Lights?" 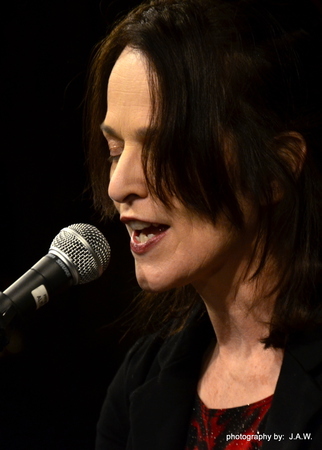 Sue will be the featured Guest at the Elora Acoustic Cafe, Elora Centre for the Arts, Elora ON, Friday April 8th. 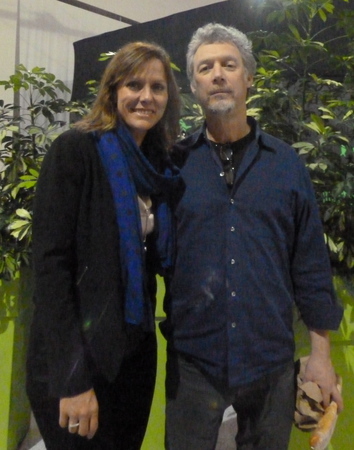 Sue Smith & Jeff Bird - HOUSE CONCERT in Guelph. Saturday March 5. 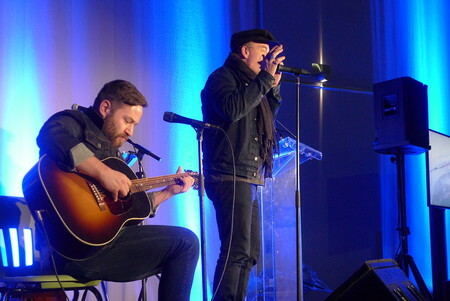 An Intimate evening of music and song. Contact fmccairley@gmail.com for tickets. Season Singers Session XXIII gets underway Jan. 29 with shows set for Sunday Februay 20 , 3:30 and 7:00 pm at the GUELPH LITTLE THEATRE.Northern lights, labradorite, mischievous tap-dancing skeletons meet Lord Borealis and Queen Aurora. Featuring all new original songs. Script by Barb Bryce, Sue Smith and Augusta Supple. Also featuring a special collaboration with the Guelph Youth Dance Company. This event will benefit the St. Patrick's Ward Community Initiative and the Eden Mills Community Club. The St. Patrick's Ward Community Initiative is a small group of neighbours have a come up with a meaningful use for Guelph's oldest elementary school (1879) which is slated for closure in 2012. 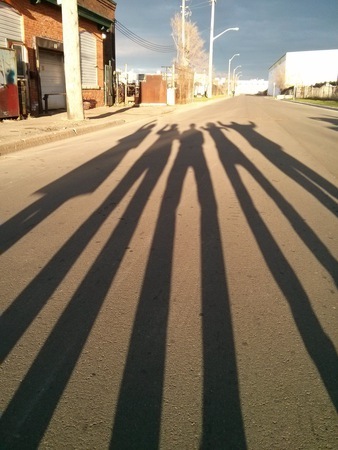 The initiative proposes a youth community centre with a full time after school staff. The centre focuses on redirecting youth from ages 12 to 18 into meaningful activities in the arts, sport, culture, new media and nutrition. The Initiative has partnered with The Canadian Autoworkers Association Local 1917 and hopes to partner with the Guelph Rotarians in the new year. The Eden Mills Community Club (greening the old community hall to make it more environmentally friendly) and the Eden Mills Millpond Conservation Association (now is in the process of raising funds to buy the 12.5 acres of land surrounding the actual Millpond) are both associated with the Carbon Neutral Initiative of Eden Mills. Join Sue, Evenine, Shannon Kingsbury, Choir in Motion, Fall on Your Feet Dance Collective, Robert Kingsbury, Brenda McMorrow and more in support of Jerome Giovinazzo's 3 year, 3 months and 3 days silent retreat for Peace. 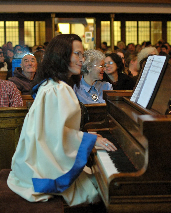 Friday December 3rd, St. James' Anglican Church, Guelph. Advance tickets at the Bookshelf and Ground Floor Music. Check out the new photo gallery of the Season Singers show, "Hullaballoo at the Grand Old Tree"
I am so excited about a new band I discovered in Campbellford: JOKERS WILD. I heard them play in July and immediately invited them to come do a show in Guelph. They are young, original and seriously influenced by Led Zeppelin and cool jazz with Nirvana and Jaco Pastorius and Chet Baker and Oasis all getting a nod. I asked RED ROSARY, a fabulous young band from Guelph to come on board. They won the Guelph Battle of the Bands which landed them a gig at this year's Hillside. They deliver groovy and original rock with brains and charm. They are great. RED ROSARY invited their friends UNION BLACK to join in the party - all of which is going to make it an amazing night of music in Guelph. I'm excited to present this ALL AGES show at ED VIDEO, Friday August 14, doors 8 pm.THREE BANDS FOR FIVE BUCKS. Come and check out three great young bands, and let's give a warm Guelph welcome to JOKERS WILD. Thank you one and all for supporting the pie project. Together we raised $500 for Les Becanes Bleues, aka Evie and Richard, for their Ride To Conquer Cancer bike ride from Montreal to Quebec City this summer. 25 pies baked and enjoyed! Click here for a feature interview on Wedding Threads in the latest GCDF newsletter. Sonic Playground will be visiting the Donkey Sanctuary of Canada on Donkey Day, June 14. Please see Calendar for more information. The Season Singers is a performing arts troupe for children aged 6 - 12 who love to sing, dance and perform. Season Singers is guided by Artistic Director Sue Smith and Designer/Artist Barbara Jean Bryce. This show marks the twenty-first session of Season Singers and is the second new musical for children created by the team. The Land of Hue takes us on a musical journey illustrating a most exclusive and informative lecture by world renowned Professor, Dr. Erasma Imaginatava Aristotalia Einsteinia Hawkview Hue, PdD, MDColour, R.O.Y.G.B.I.V. 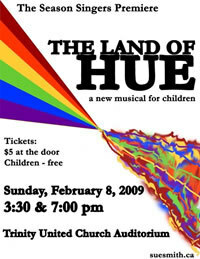 Dr. Hue will illuminate the history of the rainbow, and how a stranger, a chickadee, and a gypsy all provide foundation and fact pointing to the inevitable and vital truth of Dr. Hue’s groundbreaking theory. To RSVP or purchase advanced tickets, please email kaeja@kaeja.org or call 416 516 6030. Please join us for an intimate Fundraiser to remount Wedding Threads (Choreographer: Karen Kaeja, Composer: Sue Smith) at the Guelph Contemporary Dance Festival. The night will feature a concert by Sue Smith & Jeff Bird, performances by Karen and Allen Kaeja and a young flock of Wedding Threaders, a fantastic silent auction, food and bar and a few surprises!